The ideal travel companion, full of insider advice on what to see and do, plus detailed itineraries and comprehensive maps for exploring this exciting country.Tour Havana, Cubas vibrant capital; explore dramatic mountain scenery; or laze on stunning beaches: everything you need to know is clearly laid out within colour-coded chapters. Discover the best of Cuba with this indispensable travel guide.Inside DK Eyewitness Travel Guide Cuba:- Over 30 colour maps help you navigate with ease- Simple layout makes it easy to find the information you need- Comprehensive tours and itineraries of Cuba, designed for every interest and budget- Illustrations and floorplans show in detail the Museo de la Revolución, Capitolio, Jardín Botánico Soledad and more- Colour photographs of Cubas stunning landscape, pristine beaches, colourful capital, coastal towns and more- Detailed chapters, with area maps, cover Havana - La Habana Vieja, Centro Habana and Prado, Vedado and Plazo, and beyond the city - and western, central and eastern Cuba- Historical and cultural context gives you a richer travel experience: learn about Cubas complex history, art and architecture, music, dance and literature, festivals, famous cigars, and more- Essential travel tips including our expert choices of where to stay, eat, shop and sightsee, plus useful phrases, visa and health information DK Eyewitness Travel Guide Cuba is a detailed, easy-to-use guide designed to help you get the most from your visit to Cuba.DK Eyewitness: Silver award-winner in the Wanderlust Reader Travel Awards for Guidebook Series 2018. "No other guide whets your appetite quite like this one" - The IndependentPlanning a shorter break? 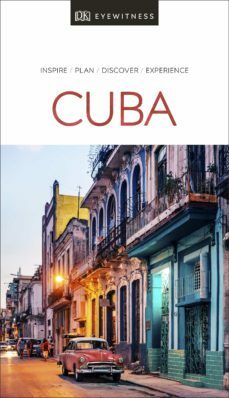 Try our DK Eyewitness Top 10 Cuba guide.About DK Eyewitness Travel: DKs highly visual Eyewitness guides show you what others only tell you, with easy-to-read maps, tips and tours to inform and enrich your holiday. DK is the worlds leading illustrated reference publisher, producing beautifully designed books for adults and children in over 120 countries.